I hope you are well and enjoying the final weeks of winter. As I sit and write this blog, it is raining. The sound of rain on the roof and the view from my window is really beautiful. It has been a fairly dry winter, so the sight and sound of rain is certainly most welcome. So, I have been thinking a lot about shoes recently – I know – some of you are really not surprised at this. I actually don’t know when I am not thinking about shoes! Every Saturday I take my gorgeous daughter horse riding. She is 14 and is a passionate horse rider. She actually wants to be a jockey, so of course I am already planning my outfits for when she rides the Melbourne Cup! When I first took her horse riding she was wearing her runners and I was wearing an old pair of sneakers. These shoes were ok for the first few weeks. The ground was dry and although there was horse poo (yes lots of poo) all around, we could manage ok by side stepping it. But then one week everything changed – it rained! Let me just say that when it rains on a horse farm, you can’t tell the difference between the mud & the poo. Our daughter was wearing her runners as we had no boots for her yet and her feet ended up soaked and very “muddy”. I was in total shoe distress as I was stepping through the “mystery mud” and it was at this moment I realised we were not wearing the right shoes for the right season! The next week we took our daughter to the horse supply shop and purchased her a beautiful pair of leather riding boots. She was set…bring on the mystery mud! Saturday came around and I realised I still needed shoes as I couldn’t handle another day of stepping through the mystery mud and then I remembered I had gumboots in the shed – winning! We arrived at the farm and horse riding began. Let me say that when you are wearing the right shoes you really don’t care what you are stepping through. It was very liberating as I was walking through the mystery mud with total confidence. Our daughter also had full confidence in where she was putting her feet unlike the week before. We had the right shoes on, we knew we were going to be ok and it really didn’t matter what we stepped in! 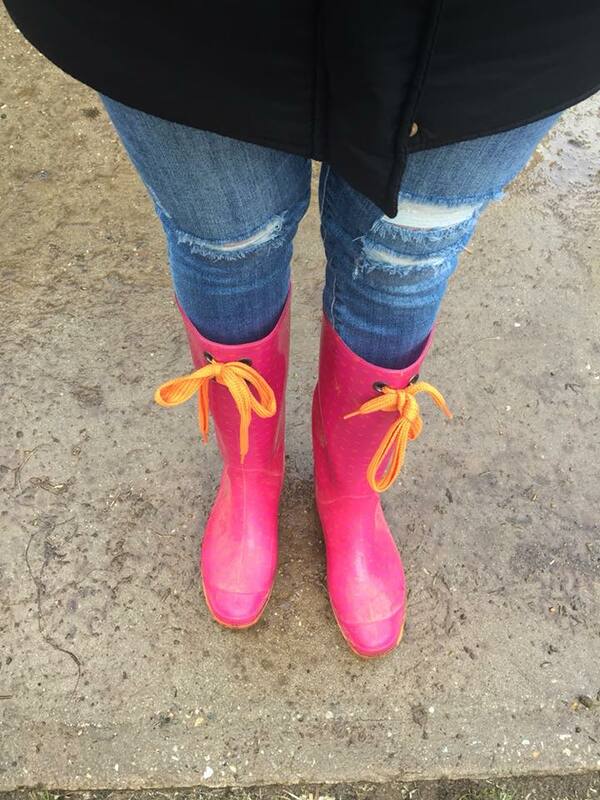 And now every Saturday morning, I switch my fashionable shoes for my sensible yet very colourful gumboots…they are fuchsia and orange because practical shoes can still be fun. And now, it doesn’t matter if it rains – the mystery mud is not going to put us off because we are wearing the right shoes. Are you wearing the right shoes for the right season? Are you in the fight of your life against illness or relationship breakdowns? Is so, you need to don some combat boots so you are ready to fight! When you are in the fight of your life it is no time for flimsy sandals that won’t protect you from harm and keep you safe…you need boots! Are you walking through the “mystery mud” of life from consequences to your poor decisions or consequences from other people’s poor decisions? Perhaps you need some gumboots on – cos unfortunately you still have to walk through the mystery mud, but at least you can walk through it without it ruining you. Are you in need of rest? Feeling burnt out and stressed? Well slippers are what you need. The feeling of a warm hug on your feet causing you to just stop and breathe for a moment…breathe in, breathe out and relax! Is life amazing and you are kicking goals on every front? Then celebrate with your best pair of party shoes!! What I am saying is to have the right attitude, reasonable expectations and confidence that no matter what you are walking through – you will get through it. If we wear peace and walk in peace, then no matter what is happening around you, you will get through it. Living in peace causes us to look up and trust, peace causes us to get up and face another day, peace encourages us to smile without fear of the future, and peace gives us confidence that the best is yet to come…just know that peace doesn’t always make sense, actually peace doesn’t have to make sense but peace will always protect us. Now take a moment and look down at your feet. Look at your current situation and consider what you are walking through today? Ask yourself – Am I wearing the right shoes? By that I mean change your attitude, change your perspective, and change your words! Let me leave you with some final thoughts from the bible. Philippians 4:6-7 reads: Do not be anxious about anything, but in every situation by prayer and petition, with thanksgiving, present your requests to God. And the PEACE OF GOD, which transcends all understanding, will guard your hearts and your minds in Christ Jesus. Ephesians 6:14-15 reads: Stand firm then, with the belt of truth buckled around your waist, with the breastplate of righteousness in place and with your feet fitted with the readiness that comes from the gospel of peace. Whatever you are walking through I recommend you wear the shoes of peace!